So Now My Future Depends on Pictures? Chemistry.com isn’t like some dating sites. You don’t get to thumb through the entire database looking for models (or liars that post old pictures of themselves) instead they give you matches. You then say if you are interested or not and that person is alerted. As we know I rarely hear back from these “gentlemen”. Recently though I did. Woo hooo! Now you can choose the stupid steps Chemistry gives you of back and forth silly questions and games or you can just send an email. He sent me “5 questions” (5 dumb cookie cutter questions someone at Chemistry.com got paid to think up). I played along, answered his questions and got his answers. Then I was done playing the reindeer games and sent him an email. He ignored that email and sent me the “love it or leave it” (more on that in a sec.). Obviously he likes the games and email scares him. 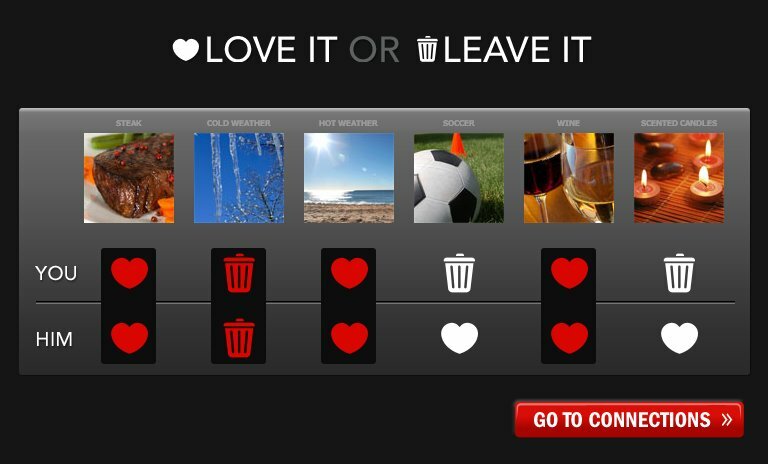 In love it or leave it the person is given 6 computer randomly chosen pictures and you say if you love it or leave it. Then you compare the answers with the other person to see if you should fall madly in love or not. Sigh. Above is our “comparison”. I’m not sure what this means as I didn’t get a guide into reading silly Chemistry game answers. Obviously we can’t fall madly in love as we didn’t get all 5 matched. Bummer. I’d like to point out I struggled with a few of these as I live in the grey. Not so much black and white. Hot Weather for example. It’s okay to a point but I can’t do extreme heat for long or I’ll either dehydrate and die or become a sweaty ball of ewe (like the Wicked Witch). And “Scented Candles” .. what scent? I can do pumpkin and have numerous ones in the house. I like some scented candles which anyone who has been to my house will know but ‘SCENTED’ = ‘SMELLY’ to me and I don’t want someone showing up to a date with a rose/violet smash scent of allergy sneezing fumes candle coming at me. See … this game is dumb. I agree…dumb game! Idiot should of just answered your email instead of being a WUSS!!! !